Turn off your Boxee Box the green way! I recently acquired an iPod Touch, and soon found myself with an 80GB iPod paperweight knocking around and collecting dust. Then it hit me: why not use a Pogoplug as an iPod server, effectively filling my nifty new iPod Touch with 80GB of music whenever I have WiFi access! So what’s a Pogoplug? Basically the device, from Cloud Engines Inc., is a small, low power, easy-to-use, and inexpensive ($129) gadget that lets you remotely access the contents of USB-connected hard or flash drives over the Internet. You can access that content from anywhere, using a browser-based interface on a laptop or desktop PC, or via a free mobile app on a handheld device, such as an iPhone or iPod Touch. As you can see in the above photos, the Pogoplug provides connectors for power, Ethernet LAN, and four USB ports. The quick-start instructions included with the product guide you through the easy, five minute process of connecting, configuring, and beginning to use the device. Once the Pogoplug is powered up, connected to an Ethernet LAN, and activated, it automatically logs into a free web service based at pogoplug.com (see illustration below). All that’s required to access content on drives connected to the device is a web browser interface running a desktop or laptop PC, or a suitable app on a supported mobile device. In particular, there’s a Pogoplug app in the Apple iTunes store for use on the iPhone or iPod Touch. The pogoplug.com web service acts as a control point and conduit, securely moving data bidirectionally between up to four Pogoplug-connected drives and one or more authorized Internet-connected computers or mobile devices. You configure the device and control the transfer of data by means of a simple, web-based management tool (see screenshot below). The spare iPod that I pressed into service for this project is an 80GB iPod Classic. To prepare it for use as an A/V fileserver, I began by restoring its firmware and configuration to Apple’s default factory settings, using the “Restore” function in iTunes on a Windows PC. Next, I verified that the “Enable disk use” checkbox was checked on the iPod’s Summary tab in iTunes, to ensure that the device would be accessible as a USB drive. Then, I copied my 37GB music library into the device (see screenshots below). To transfer my MP3s to the iPod, I connected it to my Linux PC, waited a moment for it to be recognized as USB drive, created a folder in the iPod’s root called Data, and then created a folder in Data called Music. Then, I selected all the folders from the MP3 library on my PC, dragged them into the Data folder on the iPod, and waited about half an hour for the process to complete. Having filled the iPod with 4,924 MP3s, I ejected it using Ubuntu’s “safely remove drive” function, connected it to the Pogoplug using the iPod’s USB interface cable, plugged the Ethernet and AC power cables into the Pogoplug, and waited a few minutes for the Pogoplug to login to the pogoplug.com web service. After getting my PogoPod system working, I hooked up my Kill-a-Watt power measuring gadget (photo at right) and measured the system’s power consumption. The readout, which rounds to the nearest Watt, showed 4 Watts power consumption, even when the iPod’s internal 80GB hard drive was spinning. Not bad! Once the web service finished indexing the 4,924 MP3s in the 80GB iPod’s Music directory, it was time to try my new PogoPod system on for size. First, I used the pogoplug.com web service to verify that I could navigate through all the folders containing my MP3s. Once I had verified, using the pogoplug.com web-based management tool, that my MP3s seemed to be where they were supposed to be, I tried accessing them from my iPod touch using the free Pogoplug iPhone app. It worked, as you can see from the screenshots below. Although it does work, the Pogoplug app isn’t a particularly sophisticated music player, lacking features offered by dedicated music-streaming iPhone apps such as Pandora, Last.fm, Shoutcast, and Apple’s own Music app. For example, there are no “Now Playing,” “skip to next,” “return to previous” widgets, and the tag reporting you’d expect when streaming MP3s is completely absent. Still, barebones though it may be, it works. More, thanks to this free app, I can now enjoy my MP3s whenever I’ve got wifi access. Anywhere in the world. I found the Pogoplug’s automatically generated music database (“Music” option near the top of the left-hand column in this screenshot) to be near useless with my type of music library, so I opted instead to create a “share” at the root of my music library’s folder structure (it’s the “Music” option near the bottom of the left-hand column in this screenshot) and manually navigate through my Music folders hierarchy, instead. You can create shares using the pogoplug.com web-based management’s file browser tool. By the way, one interesting feature of the Pogoplug that’s not well known is that when you’re accessing content on a Pogoplug from within the same Internet subnet as the Pogoplug, the data that is transferred routes directly between the Pogoplug and the accessing device (PC, laptop, iPod Touch, etc.) without having to be relayed through the pogoplug.com web service. This, according to Cloud Engines, results in greatly enhanced responsiveness for in-home streaming of music and video content. I only attempted to stream MP3 files, so I can’t vouch for how many media formats can be played using the Pogoplug iPhone app. A recent software update has now added UPnP capabilities (formerly requiring an OpenPogo hack) to the Pogoplug’s standard operating system. This new feature, when enabled, empowers the Pogoplug to provide UPnP services for streaming movies, music, and photos over your home LAN/WLAN to devices such as an Xbox360, PS3, and Seagate FreeAgent Theater+. And as you’ll soon see, it can also stream content to an iPhone or iPod Touch using apps such as PlugPlayer (described below). 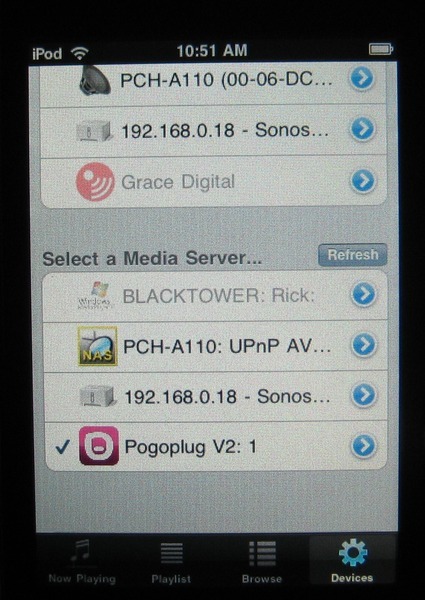 In order to take advantage of this feature on your Pogoplug, you need to enable UPnP support in the Media Settings tab of the pogoplug.com web-based management tool. So far, I’ve experimented with two UPnP content-rendering apps on my iTouch, streaming MP3 files from my 80GB iPod connected to the Pogoplug, and have found them both to be superior to using the Pogoplug app. They provide a number of UI features that I found lacking in the Pogoplug app, such as navigation widgets next track/song, previous track/song, now playing, display of current track/song info, and more. Let’s take a quick look at the two UPnP content-rendering apps. You certainly can’t beat the price of Media Link Player Lite. This UPnP content-rendering app is easy to use and offers some UI capabilities that are missing from the Pogoplug app’s media player function. One nice feature is its progress bar slider, which lets you to move forward or backward within a currently playing song. Despite its appeal, however, Media Link Player Lite had problems navigating around my MP3 library. It seemed to be unable to recognize more than 10 folders at a time, resulting in my not being able to access large portions of my media library. Hopefully, they’ll get that sorted out in a future release. Still, the app is worth a try, and might work better with media libraries organized differently than mine. Again, I only attempted to play MP3 files, so I can’t report on its ability to handle other media formats. Compared to Media Link Player Lite, the PlugPlayer iPhone app, available for about five dollars from the iTunes Store, is more full-featured, sophisticated, and useful in a number of ways. One thing I especially like is its ability to discover and select both UPnP Media Servers and UPnP Media Renderers on the local LAN/WLAN, although those features weren’t essential for basic streaming of music, video, or photo files from the Pogoplug-attached iPod. In general, the PlugPlayer app provides easy navigation of my large MP3 library using my preferred file-hierarchy-based navigation system, and also supports navigation by tag data catagories (All Music, Genre, All Artists, Albums), although I don’t use that method. Features of the app’s UI that like include its ease of navigation through the file hierarchy, the Now Playing function, and the automation building and playing of an album playlist when you touch-select the first song/track of an album. Additionally, you can use the app’s “Select” function to build a playlist based on individual songs/tracks selected from one or more albums. I also like the fact that if I need to close the app while I’m playing an album, I can get back to that album using the Playlist tab at the bottom of the screen, although I wish it remembered which song/track was playing. Small pleasures. Again, I only attempted to stream MP3 files from the Pogoplug to my iPod Touch. I’ve seen complaints that PlugPlayer doesn’t play AVI files, but I can’t confirm that. After seeing what the Pogoplug can do, it should come as no surprise that there’s more to that little white-and-pink device than meets the eye. Under its toy-like exterior lurks a tiny Linux server, complete with a 1.2GHz ARM processor, 256MB SDRAM, flash memory, four USB 2.0 ports, and a gigabit Ethernet LAN interface. The design of the Pogoplug is based on Marvell’s “Sheevaplug” hardware/software platform. The core of the Sheevaplug hardware is Marvell’s Kirkwood series system-on-chip (SoC) processor, based on a 1.2GHz ARM CPU. The SoC also integrates gigabit Ethernet and USB ports, and is complemented by 256MB of SDRAM and 128MB of nonvolatile flash memory (in which the OS resides). The OS is a modified version of Marvell’s Linux 2.6 port to the Kirkwood SoC; Cloud Engines, maker of the Pogoplug, claims to have modified the Sheevaplug platform’s Linux OS extensively. I’ve gotten a lot of pleasure from my PogoPod system in the few short weeks since I created it. My other favorite music source on the iPod Touch is Pandora, but it’s nice to be able to intersperse the never-ending surprise of my Pandora favorites with the predictability and convenience of playing my own personal MP3s while I’m away from home, thanks to the free pogoplug.com web service. And did I mention, the entire PogoPod setup draws 4 Watts (or less) of power, even while the iPod’s internal 80GB drive is spinning? Nice. I wish I had the technical skill to buy an overpriced NAS device and plug an overpriced MP3 player into it. He’s saying that his Touch can now access (up to) 80 GB of music without having the music stored on the (possible < 80 GB – I didn't read the post too closely) Touch. Not being that knowledgeable about IPod's… I assume that you can't easily connect one up to your NAS/webserver and stream music/video as you could with a Windows or Linux machine? There is a good feature here. Low power consumption. So that’s a win. For anyone who is probably running a box at home anyway, there are other solutions. Streams my media anywhere. Use a dynamic dns for Internet access and no commercial third party crap required. Stream your ogg and flac too. If you’d like hassle-free access to your music wherever you are, why not use one of the cloud-based music services like Psonar? Your entire music collection is uploaded to the Psonar Cloud and available to download to any music player you own, or you can stream your music to any internet connected device. You can also explore all the music stored in the Psonar Cloud, listen to a 30 second sample of any track and buy it if you like it. I can and do the same thing with my nslu2 and almost any of my linux boxes. Wow. Great review. I just got my Pogoplug and have already successfully streamed both mp3 and mpeg video to my android tablet over home wifi. Thanks for the tips.